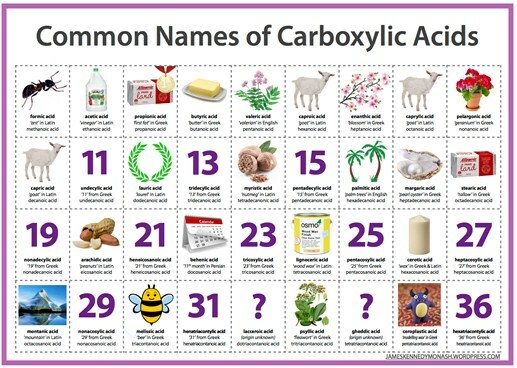 Carboxylic acids are compounds containing a functional group called the carboxyl group (-COOH). The melting points and boiling points of carboxylic acids are higher than the corresponding hydrocarbons because of hydrogen bonds. Carboxylic acids are considered the most acidic organic compounds. An ester is an organic compound where the hydrogen in the carboxyl group is replaced with a hydrocarbon chain. Esters are derived from carboxylic acids and (usually) an alcohol. Fats and oils are examples of esters. 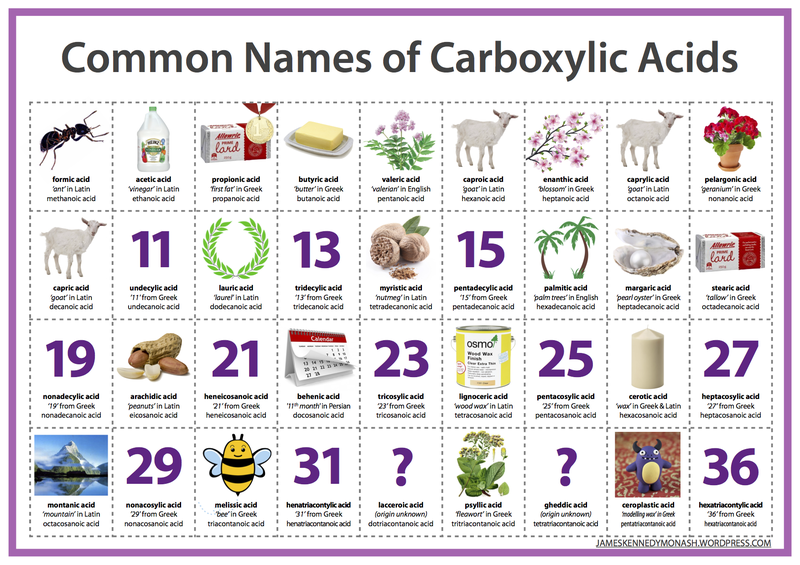 Carboxylic acids are compounds containing a functional group called the carboxyl group (-COOH). They are hydrocarbons in which one or more of the hydrogen atoms have been replaced by a carboxyl group. The general molecular formula for carboxylic acids is CnH2n+1COOH. 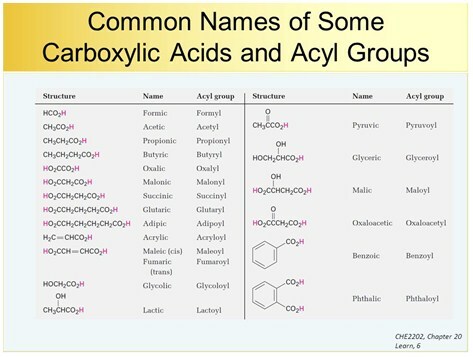 Carboxylic acids can contain one or more carboxyl groups. Carboxylic acids with two or more carboxyl groups attached are called dicarborxylic acids, tricarboxylic acids, etc. The first four carboxylic acids derived from alkanes are methanoic acid (HCOOH), ethanoic acid (CH3COOH), propanoic acid (C2H5COOH) and butanoic acid (C3H7COOH). Carboxylic acids are frequently encountered classes of organic compounds. A multitude of natural products are carboxylic acids or are derived from them. As instance, acetic acid is the acid component of vinegar. Others, aspirin for example, are the products of chemical synthesis. Carboxylic acids are widespread in nature, often combined with other functional groups. Simple alkyl carboxylic acids, composed of four to ten carbon atoms, are liquids or low melting solids having very unpleasant odors. The fatty acids are important components of the biomolecules known as lipids, especially fats and oils. Carboxylic acids are named by counting the number of carbons in the longest chain that includes the carboxyl group and replacing the -e ending of the corresponding alkane by -oic acid. and oxygen-containing organic compounds. This is due to the existence of intermolecular forces due to hydroxyl protons. Two carboxylic acid molecules are held together by hydrogen bonds. Some carboxylic acids form hydrogen-bonded dimers even in the gas phase. In the pure liquid a mixture of hydrogen-bonded dimers and higher aggregates is present. In aqueous solution they form hydrogen bondings to water. The solubility properties of carboxylic acids are similar to those of alcohols. Carboxylic acids of four carbon atoms or fewer are miscible with water in all proportions. Most carboxylic acids display a Ka value between 10-5 and 10-4 (pKa between 4 and 5). A pKa value of 5 means that about 0.1 percent of the carboxylic acid molecules are dissociated in a 0.1 molar aqueous solution. In comparison, the pKa value of the strong acid hydrogen chloride amounts to -7. The Ka value of ethanol amounts to approximately 10-16. Thus, ethanol's acidity is about 1011 times lower than that of acetic acid. Carboxylic acids are more acidic than alcohols, since the carboxylate ion's negative charge is resonance-stabilized, while the alcoholate ion's charge basically remains unstabilized. An ester is an organic compound where the hydrogen in the carboxyl group is replaced with a hydrocarbon chain. Esters are derived from carboxylic acids and (usually) an alcohol. The chemical formula of an ester is RCO2R′, where R is the hydrocarbon parts of the carboxylic acid and R′ is the introduced group. Esters, are polar molecules and so have dipole-dipole interactions as well as van der Waals dispersion forces. Their boiling points are significantly lower than those of an acid with the same number of carbon atoms because they do not form ester-ester hydrogen bonds. Small esters are fairly soluble in water but solubility decreases with increasing chain length. Fats and oils are not water soluble. Fats and oils are examples of esters. The ester is considered to be an oil (e.g., vegetable oil) if the melting point is below room temperature. If the ester is a solid at room temperature, it is considered to be a fat (e.g., butter or lard). Normally, fats contain saturated chains. The molecule is called unsaturated if it contains at least one double bond. 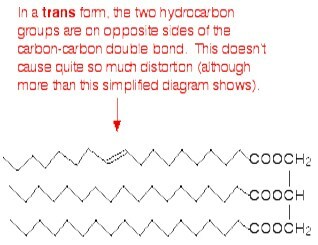 A fatty acid chain is monounsaturated if it contains one double bond, and polyunsaturated if it contains more than one double bond. The degree of unsaturation express the number of double bonds. A greater degree of unsaturation, in the molecules, corresponds to a lower melting point. When the substance become solid the chains can pack closely if there are no double bonds. The presence of carbon-carbon double bonds in the chains create a permanent kink into the chain (the double bond cannot rotate). This make the packing during solidification more difficult. In the trans- conformation, the effect is less evident because of lower distortion of the chain.